OSU’s 2018-19 basketball season mercifully came to an end in Kansas City nearly three weeks ago. It was a wild roller coaster with more valleys than hills complete with mid-year departures, close misses and ending with yet another quiet March. Now that I’ve had some time to digest this season, and recover from it, here are the top storylines I’m contemplating as we look toward the 2019-20 season. As good of a coach as I think Mike Boynton is (and can be), none of that matters if he doesn’t bring in dudes. Fortunately, Boynton has shown to be a more than adequate pitchman, so far. His upcoming class of signees Marcus Watson, Kalib Boone and Keylan Boone and commit Avery Anderson currently sits at No. 23 nationally according to 247Sports and is fourth in a very tough league. If he can land one more big fish before the May 15 deadline, the buzz around Stilly would be palpable. 2. 2019 Expectations — Friend or Foe? On paper, Boynton’s two-year tenure is more a cause for concern than for excitement. The Cowboys followed up an NIT run that many thought might propel them forward, by seeing half the roster leave and then tie for the program’s worst overall win percentage in the last 40 years. Not great. But the charisma of OSU’s young coach, and the above-mentioned recruiting buzz, have led to some probably unrealistic hopes for Year 3. Without a transcendent talent being added to this class (which could still happen), how much of an instant improvement should Cowboy fans expect? The Pokes should be better next fall — assuming all current signees and commits are on the roster — but these touted freshmen should be afforded their fair amount of growing pains, especially in a league as deep as the Big 12. What are realistic expectations? I think OSU should compete in the top half of the league next year and push for an invite to the Big Dance. Will the Cowboys fall short of fans’ preseason expectations for consecutive years? That’s very likely, but if so that might be our fault. The trio of Cam McGriff, Lindy Waters and Thomas Dziagwa have been through plenty during their three years in orange — a brand new coach in Year 1, another brand new coach in Year 2, and then having to shoulder the brunt of the minutes and production for a short-handed team this last year. Despite the flashy new names that will fill out next year’s roster, these veterans will serve a crucial role both on the floor and in the locker room. An influx of talent is welcomed, but this team will rely heavily on its senior leaders. The true freshman point guard started all 32 games, learning valuable lessons (sometimes the hard way) about how to lead a Big 12 offense. And despite the incoming front court talent in next year’s class, he should be the favorite to retain that role as a sophomore. If Likekele can continue to improve as a playmaker and can live up to his potential (and wingspan) as a defender, OSU should be in good shape at the one for the foreseeable future. 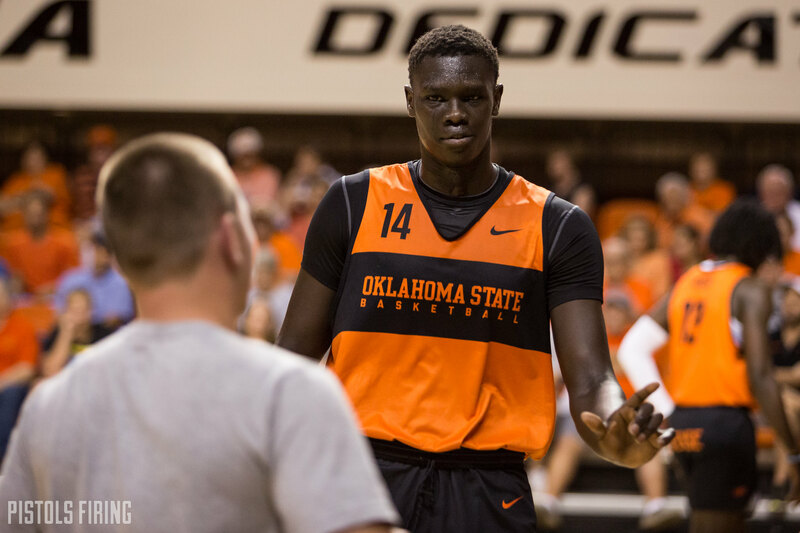 I’m downright excited to see how Yor Anei looks as a sophomore. The 6-foot-10 shot-blocking machine took a huge step forward as freshman, but the sky is the ceiling for the record-setting shot blocker. It’s been a long time since we’ve seen a Cowboy big take over a game on his own — much less as a true freshman — but Anei made a regular habit out of doing just that down the season’s stretch. If his offensive game continues to come along, and as he grows into his frame and as a player, there’s no reason the all-defensive snub shouldn’t be an all-conference selection (or better) over the next couple of years.